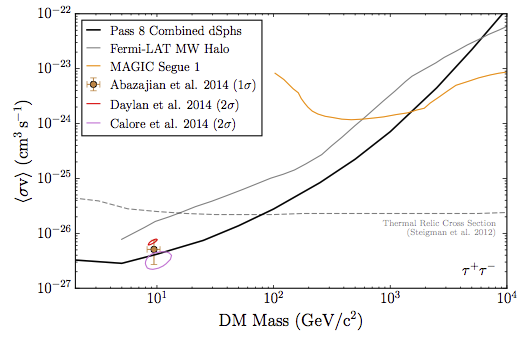 It shows the limits on the cross section of dark matter annihilation into tau lepton pairs. The limits are obtained from gamma-ray observations of 15 dwarf galaxies during 6 years. Dwarf galaxies are satellites of Milky Way made mostly of dark matter with few stars in it, which makes them a clean environment to search for dark matter signals. This study is particularly interesting because it is sensitive to dark matter models that could explain the gamma-ray excess detected from the center of the Milky Way. Similar limits for the annihilation into b-quarks have already been shown before at conferences. In that case, the region favored by the Galactic center excess seems entirely excluded. Annihilation of 10 GeV dark matter into tau leptons could also explain the excess. As can be seen in the plot, in this case there is also large tension with the dwarf limits, although astrophysical uncertainties help to keep hopes alive. Gamma-ray observations by Fermi will continue for another few years, and the limits will get stronger. But a faster way to increase the statistics may be to find more observation targets. Numerical simulations with vanilla WIMP dark matter predict a few hundred dwarfs around the Milky Way. Interestingly, a discovery of several new dwarf candidates was reported last week. This is an important development, as the total number of known dwarf galaxies now exceeds the number of dwarf characters in Peter Jackson movies. One of the candidates, known provisionally as DES J0335.6-5403 or Reticulum-2, has a large J-factor (the larger the better, much like the h-index). In fact, some gamma-ray excess around 1-10 GeV is observed from this source, and one paper last week even quantified its significance as ~4 astrosigma (or ~3 astrosigma in an alternative more conservative analysis). However, in the Fermi analysis using more recent reconstruction Pass-8 photon reconstruction, the significance quoted is only 1.5 sigma. Moreover the dark matter annihilation cross section required to fit the excess is excluded by an order of magnitude by the combined dwarf limits. Therefore, for the moment, the excess should not be taken seriously. Given the bottom line on this issue, why did Dennis Overbye write an article for the NYT focusing on the Reticulum-2 (probably false) positive results, with Neal Weiner as the go-to cheerleader? M.R.S. Hawkins just published a paper in A&A (also available on arxiv.org) demonstrating that the MACHO candidacy is still very much alive and well. Is the latter ignored because it is not the "right" answer?